My friend Kristin bagged her first whitetail deer over Thanksgiving break. Go Kristin! To be honest, I was surprised to hear it was her first deer. Kristin is so outdoorsy and has been on many a hunt, I figured she would have had the chance before. But no. She stands as proof that it’s not too late to become a hunter, ladies! 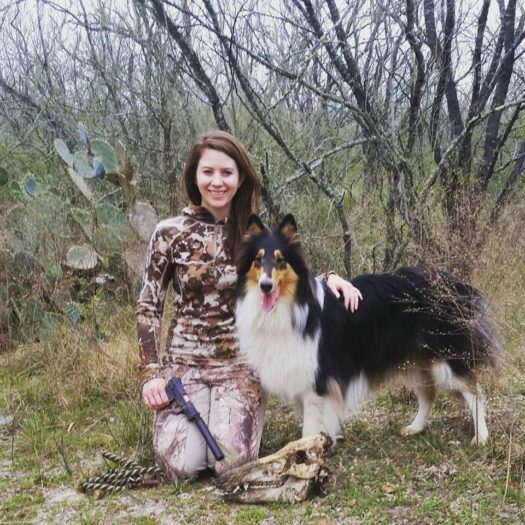 An animal lover at heart, Kristin didn’t grow up hunting and made the conscious choice to become a hunter many years ago. Now she sees it as an extension of her love of the natural world. If you’re wondering how that is possible, read on. 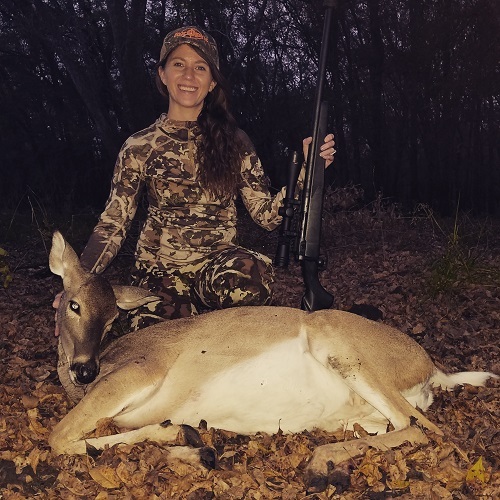 In this interview she shares how she prepared for this hunt, what it was like to shoot her first deer, and why she does it. You’re going to love her! Is it possible to not like someone with a duck named Waddlesworth? Really. Welcome to Whit’s Wilderness Kristin! First, tell us a little bit about yourself. I was born and raised in Eugene, Oregon and now call the Czech Out Ranch home just outside of San Antonio. 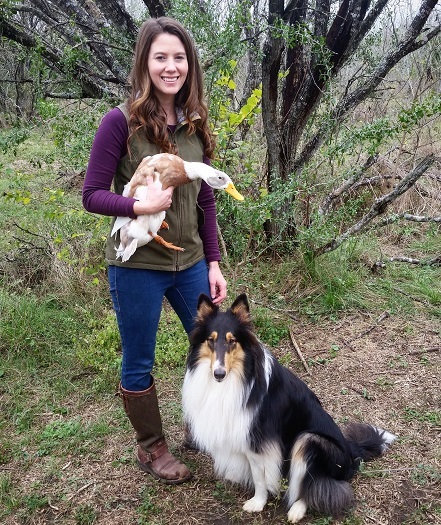 My husband Adam is a Texas native and our property is a dream that came to fruition three years ago when we moved from Oregon to live a more outdoor-oriented lifestyle on 30 acres. I am 30 years young and enjoy hiking, gardening, camping, archery and training in competitive dog sports with my rough collie Jane. Jane currently holds seven AKC titles in agility and obedience. 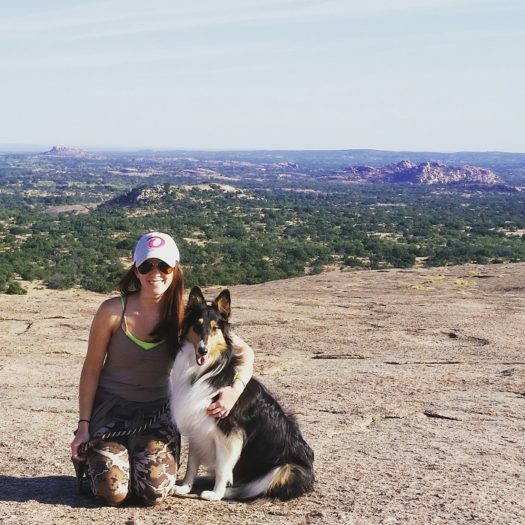 My friend Nicole and I own Cowgirls and Collies where we craft custom jewelry and dog collars. 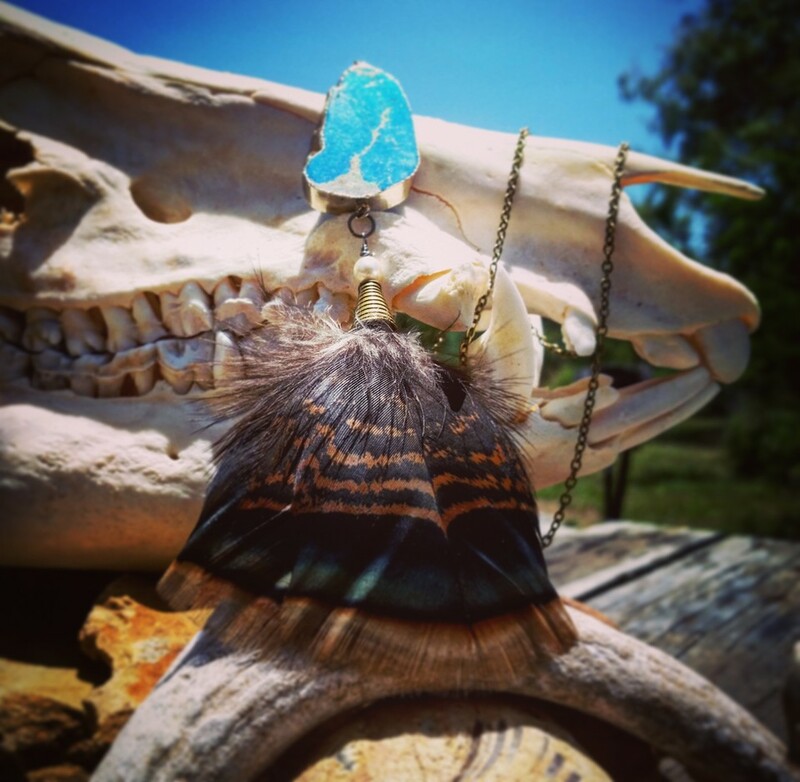 I especially love creating feather necklaces inspired by my outdoor adventures. In addition to Jane, I have 14 ducks, 1 chicken, 1 canary, 2 cats, 1 rabbit and a wide variety of wildlife on the property from bobcat to quail. I especially love raising ducks, mainly for their eggs, but also because it is impossible to be sad with ducks around; they are unique, comical creatures. My favorite duck I own is an Indian runner drake named Waddlesworth. Did you grow up around the outdoors? I have always felt a deep connection with the outdoors. I grew up playing in the woods behind our house in the Willamette Valley. My parents took my brother and I on adventures and I have fond memories of camping and playing on the beach or visiting places like Crater Lake National Park. It’s fitting because I was born on Earth Day. My mom still calls me her “mud puppy” as a term of endearment. How did you first get exposed to the idea of hunting? 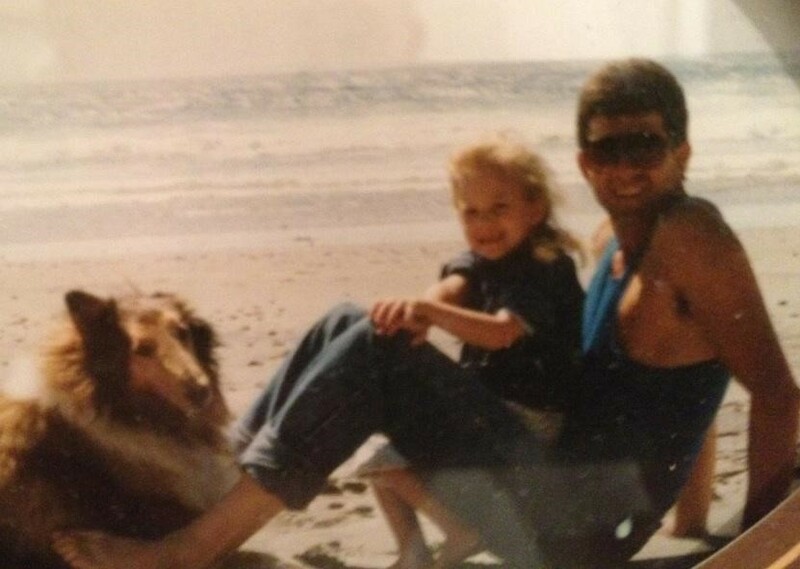 My dad grew up hunting but never thought I would enjoy it because of my gentle nature towards animals. I once named a bluegill he caught in a pond “Vince Gill” and when I found out Vince died I cried the whole car ride home. I wasn’t truly exposed to hunting until I met Adam when I was eighteen years old. He taught me the role of hunting in wildlife management and conservation and exposed me to the fact that the very places I loved hiking were preserved with dollars from hunting licenses. Before you were a hunter, what was your perception of hunting? I will admit I was a very naive to the benefits of hunting before I became a hunter. I thought I would never be able to kill or eat wild game. Even so, I followed Adam around in the woods documenting his hunting adventures with my camera. I enjoyed being in nature and seeing things that I never got to see before. I wasn’t sure how I would deal with the death of an animal but when I saw Adam harvest his first doe with a bow I was really astounded. I found that a hunter could still have remorse for an animal even though they took its life. What was the first animal you ever hunted? The first animal I hunted was blacktail deer with my bow. In Oregon you primarily spot and stalk deer so it was quite an experience for me, though I was unsuccessful in harvesting one. I will never forget two does hashing out their territorial anger mere feet in front of me. I stood there hoping they would mistake me for a tree. Or the time I hunted in the snow and a buck came in just yards out of my comfort zone. Bow hunting deer helped me discover some of the most beautiful land in Eastern Oregon that I would have never seen before. 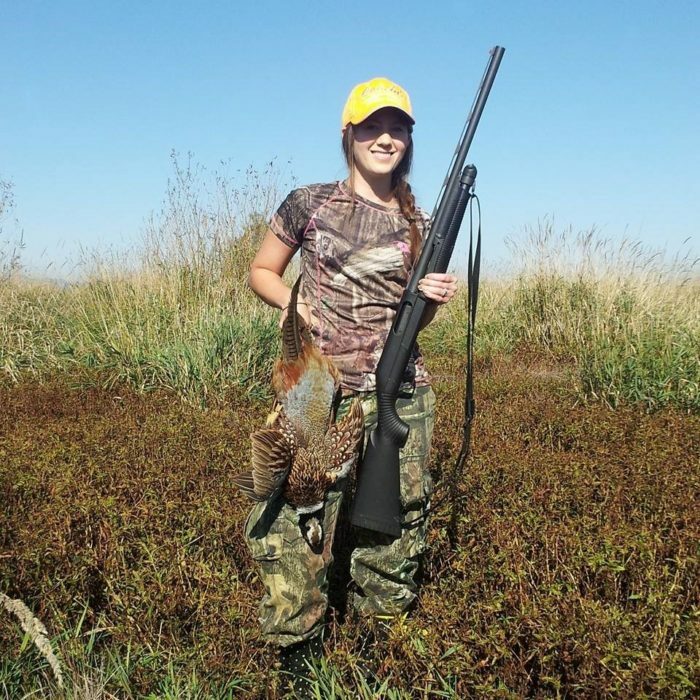 The first animal I ever harvested was a pheasant with Adam’s 12 gauge Benelli at Fern Ridge Wildlife Area, a place I had grown up visiting my whole life not knowing that it was used for hunting. After that first pheasant I researched and purchased my own shotgun, a 20 gauge Mossberg which fit my petite stature perfectly. Since then I have proudly harvested duck, dove, jackrabbit and turkey with that shotgun. My first pheasant hangs in my office as a reminder of how far I have come since that moment. I did eventually end up harvesting an animal with a bow when I moved to Texas–a feral hog. What made you want to take a deer? I wanted to harvest a deer primarily for food. As carnivores, we spend a lot of money on beef but I know the benefits of eating lean, natural venison. Knowing where my food comes from has become important to me. Though I have had the advantage of eating venison harvested by Adam over the years I wanted to be a contributor. Eating a deer you harvest is just as gratifying as plucking a tomato from your garden. I dream of a day when I’ll never have to purchase meat or the majority of my vegetables from a store. How did you prepare to go deer hunting? What were some of the best resources you turned to? I am fortunate to be married to an avid hunter and outdoorsman who has been my primary resource guide through it all. 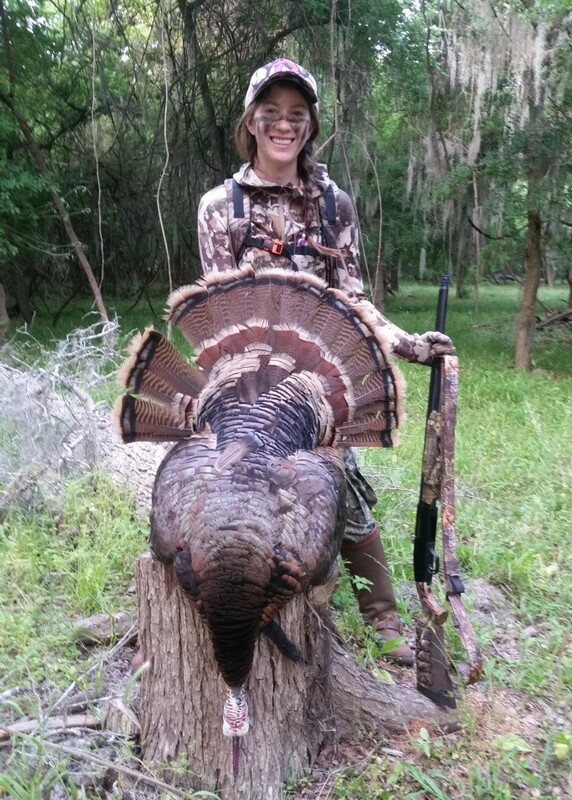 Adam became an Eagle Scout at the young age of thirteen and grew up hunting with the Texas Youth Hunting Program. He is the smartest person I know when it comes to firearm safety and information. That being said I have reached out to many women through social media for guidance throughout the years. Women like Sarah Fromenthal, Andrea Haas and Christine Cunningham have always encouraged me. And of course, Whit’s Wilderness! I watched and aided in the hunt long before I ever became a hunter. I think that by doing so it really helped me develop all the skills it takes- patience, strategy, persistence, safety and more. I now love guiding and helping others achieve their hunting goals. What gun did you use and how did you choose it? I used a Savage .308 rifle with a SilencerCo suppressor. I can’t tell you how many people I have met who suffer from hearing loss due to firearms. Wearing hearing protection during the hunt is difficult when you need to hear the game you seek, surroundings and/or your hunting partner. I guess that is a benefit to bow hunting. One of my biggest worries when hunting is improper shot placement. I pray for a quick kill and the least amount of suffering for the animal I seek. A suppressor aids in this goal by reducing recoil and muzzle flinch. Suppressors are regulated under the National Firearms Act and though they involve some extra requirements to own they are worth it to me. How did you go about getting comfortable with your gun? As with any weapon, target shooting is the primary way I get comfortable with a gun. Knowing how to safely load, unload and take any gun on and off safety are the most important things for me to feel confident in the field. Give us a run down on the experience, from the moment you left the ranch house to after pulling the trigger. Waking up around 4 AM in Victoria, coffee was in order before we headed to the New Ranch in Fannin about a half hour away. 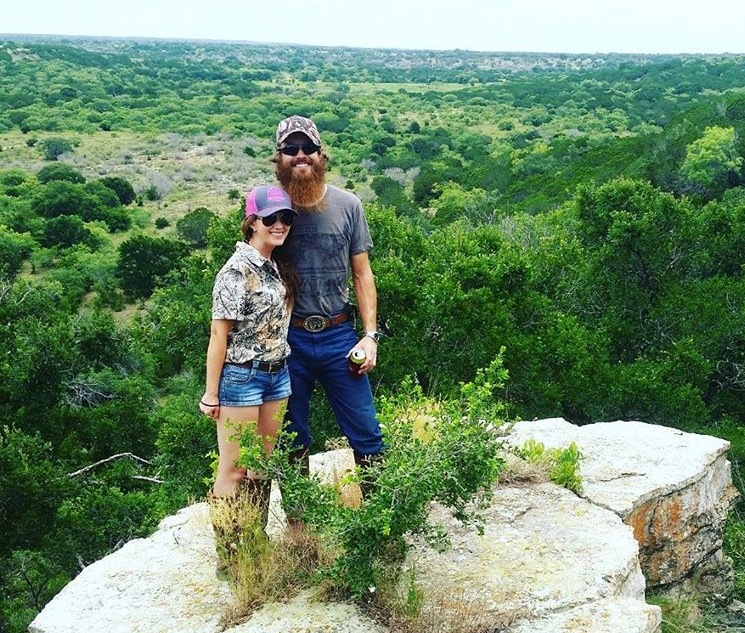 Our good friends Devon and Chris Bethune at New Ranch Outfitters own and operate the 3,000 or so acre low fence property along the banks of the San Antonio River. Our Thanksgiving weekend had consisted of amazing home cooking and wonderful hospitality and we were ready for our second day of hunting. Adam had harvested a doe the day before. As Adam and I headed out to the river bottom where we would hunt that day, Chris hollered to me, “There’s a buck down there with your name on it!” It turned out that there was a cull eight point in the area that was fair game. At first light, we saw a buck a hundred yards off and after much deliberation we figured out it was not the cull I was after. Several does made an appearance as well, however, a very large branch in the oak tree in front of our blind made it impossible to get a proper shot. It was frustrating but we hoped the does would come closer. We were watching the does when out of nowhere appeared the biggest buck I have ever seen in person. Remember, I am originally from Oregon where our deer are much smaller bodied. It was the cull buck. I placed my sights on his big body, as close to the vitals as I could and followed him as he eagerly walked away towards the does, sniffing the air. The only time he stopped was partly behind a large tree. A part of me wanted to pull the trigger but I knew it was not the perfect shot placement I had envisioned. He quickly disappeared into the woods, along with the does. I was disappointed and questioned my judgement on the cull buck when we headed into the evening hunt. I really wanted to provide food for Adam and I. Would I ever get an opportunity again? Could I be successful? Maybe I was overthinking deer hunting too much or my expectations were too high. These thoughts went through my head as the evening went on and no deer were to be seen. At around 5:30 PM I had given up hope of seeing anything when Adam tapped my shoulder. A doe and a young buck stepped out into my shooting lane. Adam confirmed that the doe was a good size and reassured me that the young buck was of age. Something I knew but needed him to confirm to feel more confident. I waited with my sights on her as she slowly turned back and forth, foraging. When she turned perfectly broadside I aimed at her vitals and took a deep breath, squeezing the trigger, taking my time. When my rifle went off I watched as the doe stumbled and fell mere feet away from where she had been shot. I had harvested my first deer. What are some of the emotions you felt right before and after pulling the trigger? I was worried I would make a mistake in my shot placement. Afterwards I was thankful and happy it had been a swift kill. A deer in the wild can be killed in much more gruesome ways, either by a predator or a moving vehicle. I had executed, as it turns out, a perfect shot in the heart. Did you clean the deer yourself? Adam and I cleaned the deer together. My favorite part about cleaning a deer is skinning it because I am really interested in learning to tan hides. I am still learning how to clean a deer but gaining more confidence every time. I use a custom BRT Bladeworks knife from Oregon that Adam bought me 7 years ago. This knife has never known a dull day and I still send photos of it in the field to the knife maker, Ben Tendick. He says it is the most used knife he’s ever made. We hung the gutted deer in a walk in freezer located at the ranch and the following day quartered it for transport. Do you have any advice to first time hunters? Go at a pace that suites you. At the end of the day it is all about making memories, regardless of the outcome of the hunt. I have never been pushed into hunting or doing anything that I didn’t want to do. I only push myself based on my goals. It may have taken me a long time to harvest a deer but I always felt comfortable, even when the anxiousness of defeat hit me. I never felt pressured. I had a lot of ups and downs, believe me, and someone needs to tell the first time hunter that’s ok. I think sometimes experienced hunters lose patience with those less confident in the field. I know you are an animal lover. Why does hunting make sense to you? Living on the land has really influenced the way I think about hunting and its role. I see and interact with wildlife on a daily basis. I respect, yet curse the coyote. My heart flutters when I bust a covey of quail in a bush or see a grey fox on my trail camera. I feel connected with these animals in a way I never experienced before. What drives me to hunt is being joined with nature, creating memories outdoors and doing my part to balance wildlife populations that the land can support. What about wild game is appealing to you? When I tasted venison for the first time it agreed with all my values of natural, hormone-free food, and plus it was delicious! There has been resurgence in localized, all natural, healthy eating but like anything it has turned into a commercialized fad, with “organic” labels slapped on anything these days. The majority of Americans out there are still disconnected with the food they eat, organic or not. I was once one of those people. When I became a gardener and a hunter I started looking at food a lot differently. My food symbolized my hard work, dedication and I knew exactly where it came from. I was proud of the food on my plate. Is there anything you don’t like about hunting? The romanticism of one animal over another. To me, every native animal holds a special place in the balance of our ecosystem. There is a tendency to hate seemingly ugly creatures out there that don’t have doey eyes or big trophy antlers. Case in point, the Javelina. The Javelina is a native species to Texas that many deem ugly and inedible. I happen to think they are just one of many unique and interesting animals native to Texas and I can tell you they are very edible. 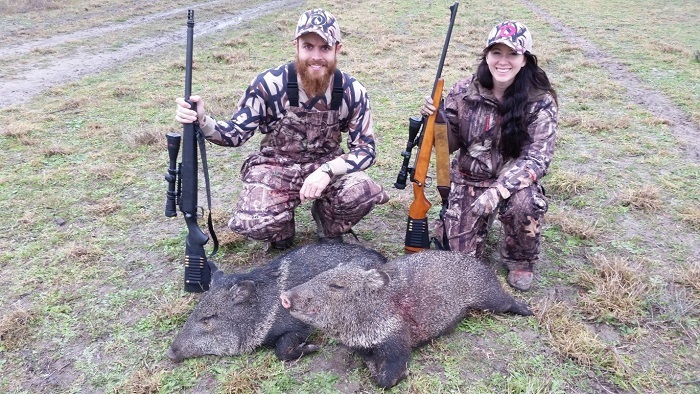 My first rifle kill was a Javelina and it happened to score second place in the Texas Big Game Awards last season. In general terms, I dislike when hunters show lack of respect for any of the game they seek. I don’t think that they represent the majority of hunters out there. If anything, they contribute to the decline of our rights by misrepresenting what hunting is truly about. We need to start realizing that not everyone has to hunt our way or even be a hunter to be a supporter. The more people who respect hunters as conservationists and wildlife stewards, the better for the future of hunting. Okay, I have to ask a field fashion question because you know me, that’s what I do! What did you wear? In the short years I have been hunting, I have gone from wearing an oversized men’s camouflage sweatshirt and army pants to the latest technological outerwear designed for the female hunter. Let me tell you, it makes a difference! I primarily wear the First Lite Alturas Guide Pant and Artemis Hoody with Larkspur base layer pants underneath. I love my First Lite gear. It is form fitting, comfortable and wicks moisture. I have also worn their apparel while hiking and been comfortable in hot afternoons in Texas. 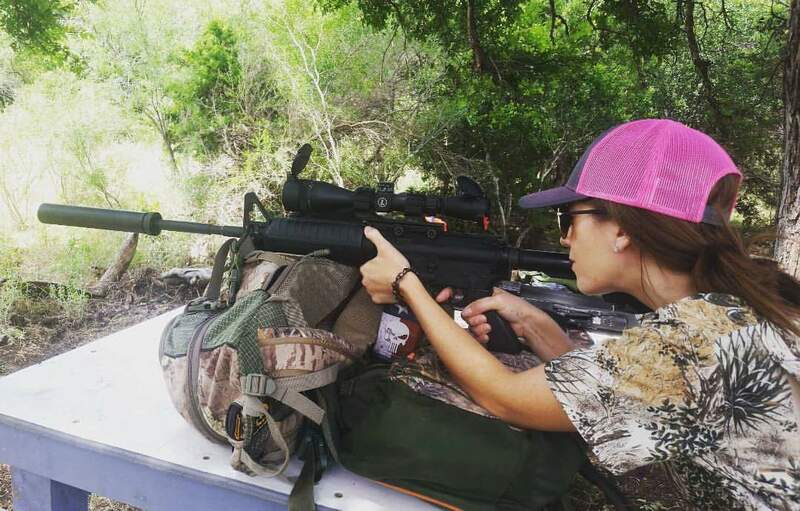 I hope First Lite will continue to add to their inventory of hunting apparel for women. Were there any key pieces of equipment you were glad you had brought? Gloves: For being a Northerner I get extremely cold easily! Despite rising temperatures I wore my gloves all day during that hunt. Keeping my hands warm is really important to me to feel comfortable in the blind and while out in the field. Snake boots: I wear my Chippewa snake boots just about everywhere, at home on the property or out in the field. Walking long distances might be tough in them because they are a little heavy but they are a necessity. My favorite thing about them is that they have a lifetime warranty. You hunt lots of other animals, what are some of your favorites? If I had to pick one animal to hunt for the rest of my life it would be the turkey. I love everything about turkey hunting. Hearing them glide down from the trees in the morning, sitting under a tree and calling them into a decoy or spotting them from afar and trying to cut them off. I love their beautiful feathers and watching them strut around their semi- impressed hens. I hope to fulfill my goal of Sandhill crane hunting in Texas one day and my number one dream hunt would be ptarmigan in Alaska. 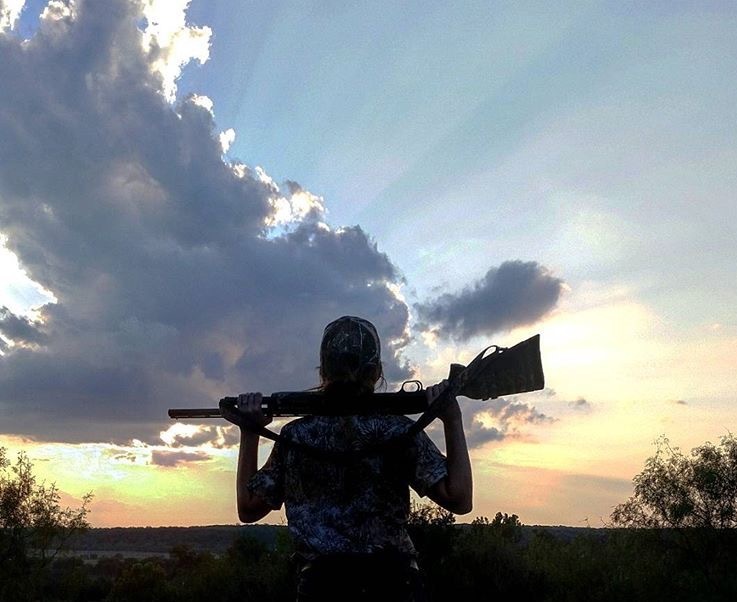 Any parting thoughts for women considering hunting for the first time? My advice for other women is to not get discouraged. I am always learning. If you are unsure about hunting ask to go with a friend who hunts to see what it is all about. My mantra is I’m a professional in humility, not hunting. You don’t have to act like man to be successful in the field. You don’t have to hunt alone, you don’t have to pull a heavy draw weight, rattle in a big buck, or shoot a weighty 12 gauge. If you do, more power to you! Find out what drives you to get out there, whether it is the culinary aspect, the meditative outdoor experience, the exercise or the thrill of the hunt itself. Go out there and do it. Where can everyone find you on the internet? Thank you for sharing your experience with us. You’re an inspiration! 3 Replies to "The Adventure of Getting Your First Deer"
Excellent article! I have a love/hate relationship with hunters as some are very responsible, while others are not. I really like that she’s conscientious of her shot placement since that’s less suffering for the animal. Don’t get me wrong, I eat meat, but I’m also very empathetic towards the treatment of animals. I hear ya. Fortunately I know a lot of good hunters! 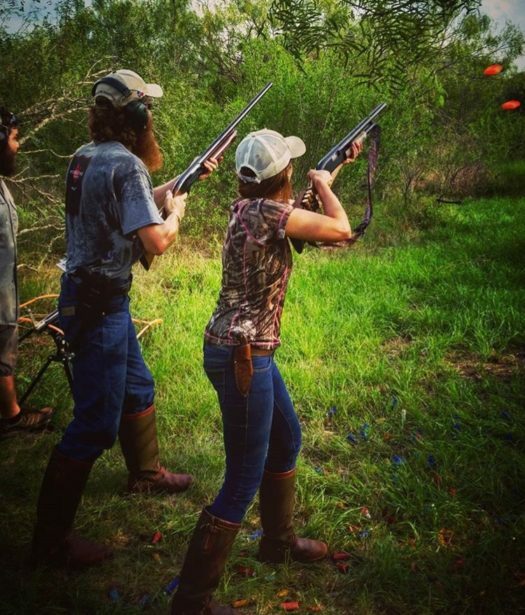 In Texas everyone who hunts is required to take a hunter education course which teaches proper shot placement. But there’s more education that needs to be done, for sure. I definitely believe in gun safety and ethical treatment of animals!